Tender Greens is coming to NYC! Opening on Feb 5th in Union Square with Chef Peter Balistreri at the helm, we'll be serving up the same elevated comfort food you all know and love, with some new additions to the menu. Daily Charcuterie Board featuring P. Balistreri Salumi, local cheese, and seasonal pickled vegetables. Lobster salad featuring Luke’s Lobster Maine lobster tail, baby gem lettuces, watercress, celery and apple slaw, radishes, citrus herb breadcrumbs, tarragon dressing. Coffee and cold brew from La Colombe Coffee. Craft beer on tap from Brooklyn Brewery, and wine from local vineyards. We've partnered with local farmers and artisans including Gotham Greens, Satur Farms, Sea 2 Table, GrowNYC, and Beecher's Cheese to source the best local ingredients that meet our high standards. Find us at our NY home in Union Square: 900 Broadway, New York, NY 10003. To celebrate the opening, we're giving away one month's worth of Tender Greens for FREE! Enter our CA vs. NY contest for a chance to win. Write your answer on the card: Tell us which state is your jam and why. Tag your New York friends to tell them that we’re opening in their city on Feb 5th! We'll choose the winners based on the funniest answers. We'll share our favorite posts on Instagram so follow along. 3 winners will be announced on Feb 20th via Instagram. Bonus present: Send your friends some hot soup to get them through the winter. Download the Tender Greens app and send them an invite. Soup for you! Download the Tender Greens app and send them an invite. Soup for you! 1. ENTRY: No purchase necessary to enter or win. 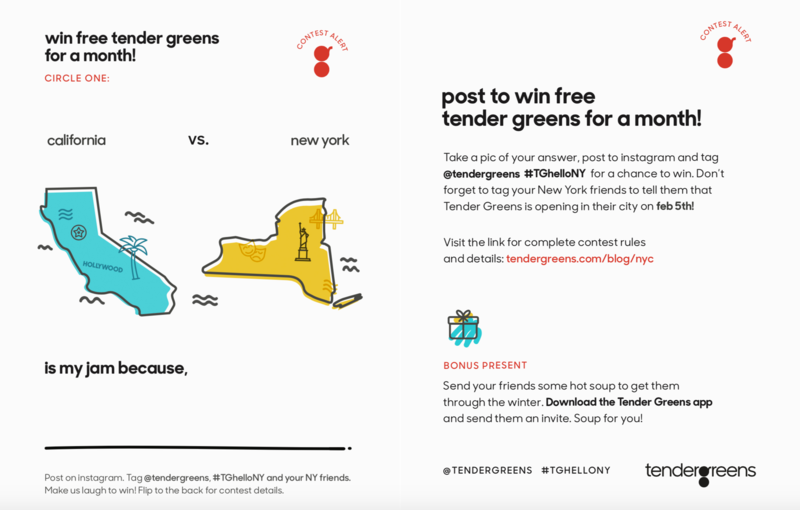 Contestants enter by submitting photos via Instagram (“submission”), following @tendergreens and using #TGhelloNY. Contest begins at 12AM PST on 2/1/2018 and ends at 11:59PM PST on 2/19/2018. 2. ELIGIBILITY: This contest is open only to legal U.S. residents, over the age of 16. 3. WINNER SELECTION: Three winners will be announced on 2/20/2018. Submissions will be judged on creativity and humor of the photo and answer. All decisions are final. 4. PRIZES: Each winner will receive (1) $500 gift card to Tender Greens. 5. WINNER NOTIFICATION: Winning photos will be featured on the Tender Greens Instagram account and winners will be tagged and notified via Instagram Direct Message. Further instructions on how to claim their prize will be given. 6. GENERAL CONDITIONS: Participants hereby grant Tender Greens a non­exclusive, perpetual, worldwide license to broadcast, publish, store, reproduce, distribute, syndicate, and otherwise use and exhibit the “submission” (along with their name, voice, performance and/or likenesses) in all media now known and later come into being for purposes of trade or advertising without further compensation. 7. USE OF CONTENT INFORMATION: All entries become the property of Tender Greens. Tender Greens reserves the right to use and and all information related to the contest, including submissions provided to the contestants, for editorial, marketing and and other purpose, unless prohibited by law. 8. NOT ENDORSED BY INSTAGRAM: By participating in this contest, You acknowledge that this contest is in no way sponsored, endorsed or administered by, or associated with, Instagram and release Instagram from any and all liability arising from or related to this contest. 9. CONDUCT: All contest participants agree to be bound by these Official Rules. Tender Greens in its sole discretion, reserves the right to disqualify any person it finds to be tampering with the entry process, the operation of its web site or is otherwise in violation of these rules.